Recipes using all types of pasta. You can make your own, but it’s very cheap to buy. 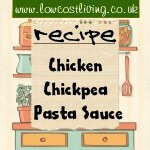 This pasta sauce recipe with chicken, chickpeas, and vegetables is great for making in bulk then freezing up for quick and easy mid-week meals. 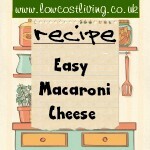 This easy macaroni cheese recipe is quick to make and can be altered simply to give a range of recipes in one-pot. Great for quick mid-week meals. 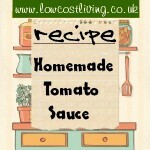 Homemade Tomato Sauce is great with fish, meat, pasta and rice. For an extra "kick" chop up a chilli pepper and add to the ingredients. Recipe for Aubergine and Macaroni Casserole – Serves 4 – A wholesome vegetarian meal. Recipe for Vegetarian Minestrone Soup – Serves 4 and nice if accompanied by a bowl of grated cheese to be handed around. Recipe for Spaghetti Carbonara – Serves 4. Recipe for Macaroni and Bacon Casserole – Serves 4. Recipe for Penne in a Hot Pepper Sauce – Serves 4. Recipe for Macaroni Cheese – Nice served with a green salad. Very filling.